Stop Stop..wait! Yet to make Naan? Don't own Tandoor to whip out that authentic Naan? The Oven made ones not coming out as well? 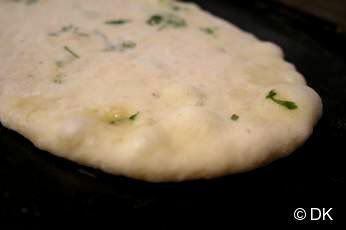 Your search ends here :) You make this bready, soft and absolutely delicious Naan on a skillet as well as Oven/Tandoor. Take it from me, this is absolutely delicious. You can't go wrong...Even if you manage to have a dough which has not risen at all, don't throw it away, the Naan's made from those also come out absolutely delicious. 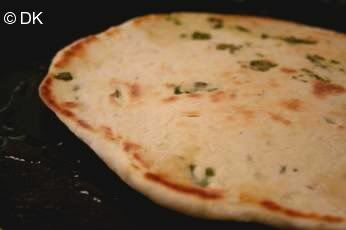 This Coriander Naan (Flatbread) is the recipe from the British chef Simon Rimmer. I have tweaked this recipe only a wee little bit. 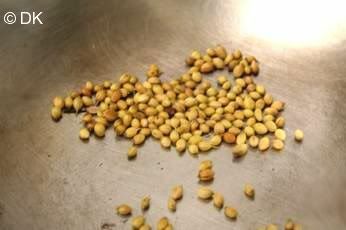 Coriander in Indian terminology represents two things - Coriander Seed and Cilantro. Indians generally don't use the term "cilantro" that much - its either Coriander (which means the herb) or Coriander Seed. Hence I have used both these elements in this Naan - both the spice as well as the herb. The result is a beautiful amalgamation of soft,spicy and herby delicious Naan. 2. 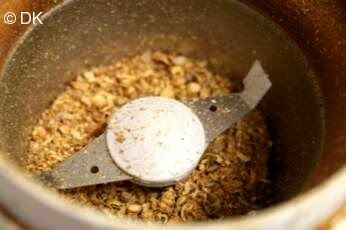 Crush them coarsely using a Mortar and pestle, or use that coffee grinder that has been lying around unused for a while now :) They are perfect for this. 3. Put them into a pan with the water and bring it to a boil. Set aside. 5. 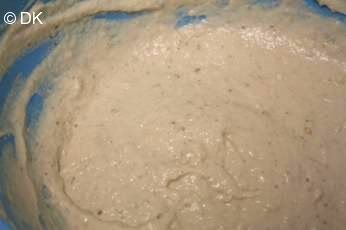 Add 1-1/2 cups of flour and stir it well until blended. Cover the bowl and let it prove for 30minutes. 6. Then add the salt, oil and the remaining flour. 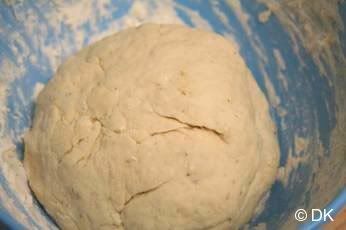 Knead it well on a lightly floured surface until smooth and place it back in the bowl. Cover it and let it double - approx 1 hour. 7. 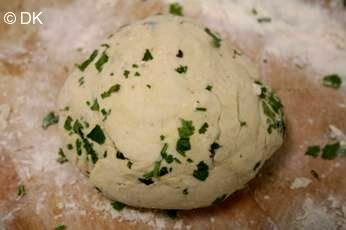 Then punch it down, turn it down on a lightly floured surface and slowly add in the chopped cilantro into the dough. 9. On a skillet, place the naan, brush it with little oil. 10. once its done on one side, turn it the other side. Hello, I tried this today and it came out wonderful!!! Added grated garlic along with coriander leaves and baked it in the oven. I halved the recipe but had to use around 1/4 C water extra, maybe its the consistency of the yogurt. Thanks a lot for the recipe and instructions. You have a beautiful blog with wonderful recipes. I was just wondering if this recipe is lower in fat than most found in the store? I made these last night with my boyfriend, along with curried cauliflower and chicken tikka masala. We were so excited to be making nan because we are both such fanatics, but our bread came out a bit heavy and doughy in the end. It tasted pretty good but the doughyness through off our enjoyment. Any suggestions? Are they supposed to be a bit heavy? I have been trying to make naan for years, tried different recipes but I was never satisfied. I will try making this tomorrow and let you know how they turn out. DK, Yesterday I made this Naan for Dinner and it was big hit. Even my 3 year old who is picky eater enjoyed so much. Thanks! for wonderful recipe. I werent able to get all that flour mixed in. I think i only managed to get 3.5 cups in there. Should it really be necessary to get all 5 cups mixed in? This is not a vegan recipe. It has yogurt, which is dairy! oops! This is what happens when I get overzealous with tagging. Sorry about that! 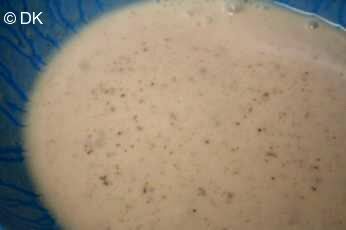 Hi Dhivya, I was wondering, can you use instant yeast instead of active dry? I always seem to have better success with the instant variety. :? : if using a microwave on convection setting, what shud be the temp and time settings? ?ran out of cooking gas, hnc! I made these tonight, they were real tasty. I put ramps in (mountain spring onions) with the cilantro which worked nicely, then wrapped up chicken with veggies and tsatsiki sauce. I cooked them in olive oil, because I have no ghee and didn't want to burn butter. They're perfect for wraps because you can make them any size- thanks! Oh and what temp for broiling? Oh and also could you tell me how much would the measurements be in grammes? or how i could figure it out..? :oops: thanks! Hi, I want to make this but before i do i wanted to ask about the oven/broiler setting.. this may sound silly but here goes.. is the broiler IN the oven? or is it seperate? and also, if it is in the oven which symbol is the broiler sign on my oven? Thanks. Naan say Eat Me Now...I am sure gonna make this for TH who is crazy about it. helo..do u use metric cup or US cup for your recipes? Hi, you don't put an amount for the fresh coriander in the recipe, i am guessing 1 to 2 tbs but want to be sure? I tries this recipe last night and it was fantastic! Thanks!! Hey Dhivya, looks awesome.I bet it tasted good too. Inspired by this I made parathas and it came out well...Thanks! @Aparna - well I usually dont go for skillet that often - but I think its more the no. of minute u keep in the oven. It should be more or like put it inside, Yawn, take it out...thats how fast..otherwise they become hard. I make my naan on the stove-top too. While it tastes best in a tandoor, I prefer the stove-top version to the oven baked one every time. The naan is much softer, in my opinion. Thats a lovely naan dhivi...great one! You know that I have bookmarked this! Thank you! Your naan looks perfect. I'm ashamed to admit I've never made my own but always wanted to. Soon, soon ..
Beautiful naan recipe DK, I will definitely try it soon, especially since I have been craving home-made naans recently. 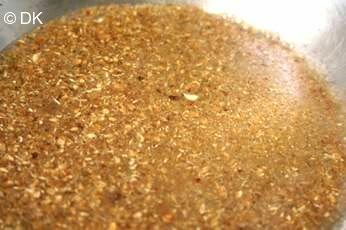 BTW, I did make ur barley-wh. flour rotis and loved them. looks perfect Dhivya! Lovely pictures as always. I have always wanted to try naan at home. But with the fear that they dont turn out well have kept postponing. 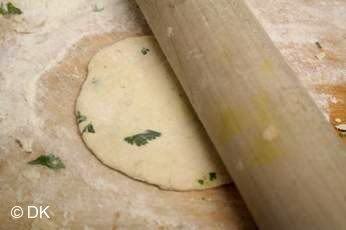 Your recipe really inspires me Dhiv..
Amazing Naan..Nice step to step procedure..Very tempting..
Great pictorial for naan making. Coriander makes them special. My naans always a faliure, i must try your cersion in a skliet. ever since i tried your blueberry cake u've become my food guru! i hop over at least once a week to check out this space :) this looks great, just the kind of thing my picky toddler might enjoy. will try this over the weekend and let you know how it goes! Wow, that must have tasted wonderful! The pictures are so pretty too..
Coriander Naan looks beautiful. 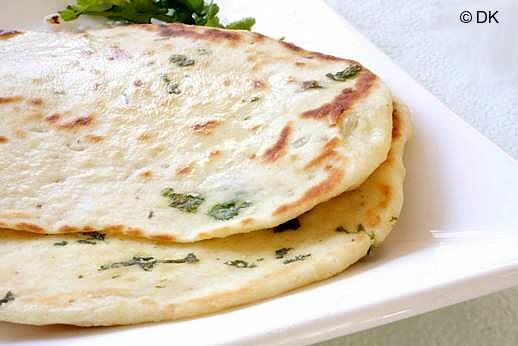 Never thought of adding coriander seeds to Naan. They look very tempting. naan and chcikpeas curry look yummy! lovely photos! 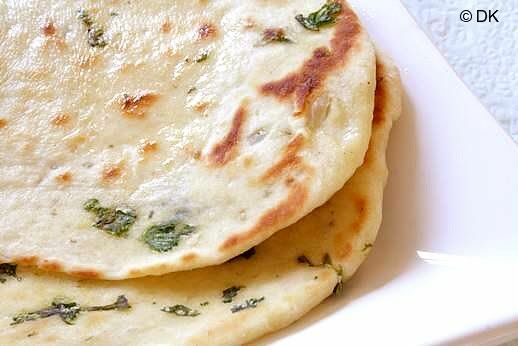 Naan looks amazing..eyecatching clicks..tempting me a lot..
as usual nice pics n step by step procedure DK..you make us to prepare recipes very easily by giving deatailed procedure with pics !! lovely! your step by step pics always help! gotta try it.